In my trip through the South Pacific I visited some truly stunning islands and beaches. I kept thinking that I had seen the most beautiful place then went on to the next one and was mesmerized again. And again. And again. Until I arrived at Aitutaki Lagoon. Bora Bora lagoon redefined the meaning of the word blue to me. With so many shades from the greenest emerald to the naviest blue the lagoon has them all. It was like staring at all pantones. So when I left and headed to the Cook Islands I was already speechless and completely overwhelmed by the beauty of this part of the world which I had already explored two years before. Rarotonga, the capital of the Cook Islands, was a different experience, it was more of a volcanic and green island rather than a beach one so it was great to recharge and “reset” the beauty overload I had experienced in Bora Bora. But this was not going to last long because after three days I flew into Aitutaki. This tiny island with barely 1,000 inhabitants is a pearl of blues and a treasure trove of palm trees and white sand beaches. The best way for me to define it would be to ask you to think of the most stereotypical postcard-perfect photo of a tropical island you can think of and that is most likely how Aitutaki Lagoon looks like. 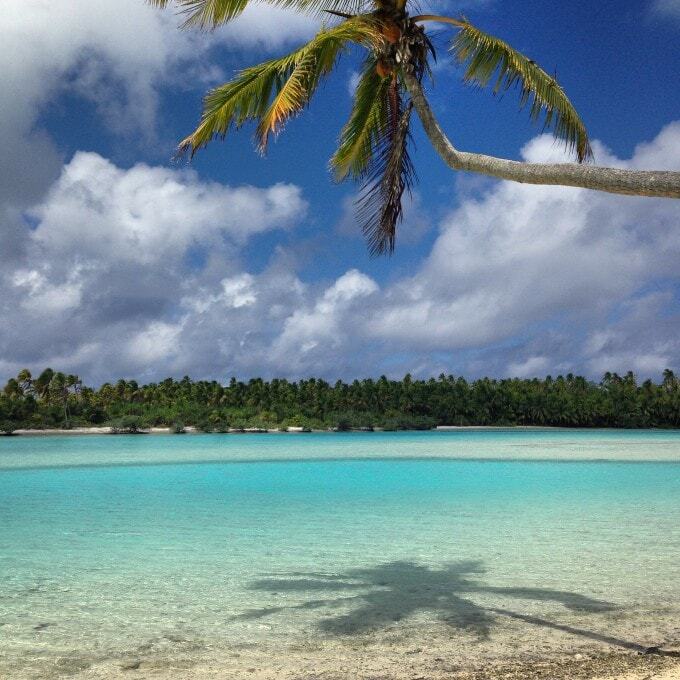 If Bora Bora had the widest range of blues Aitutaki does the lagoon colors like no other island. Mostly a shallower lagoon than Bora Bora and sprinkled with powdery beaches and young coconut trees it embodies the definition of paradise. 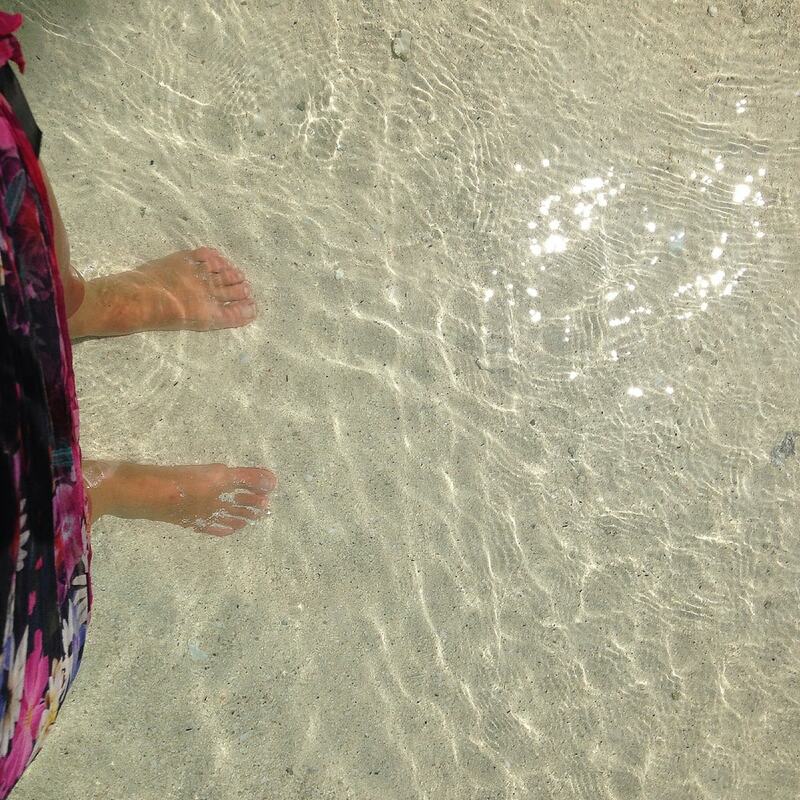 The waters are so clear and so warm that you may not realize you got wet. The beaches feel untouched, even if a few tourists make it to this end of the world, broken corals litter the shores and old coconuts fall from trees that sway in the wind. I just could not stop taking photos. Most people will visit the lagoon on an organized tour with one of few companies. Most tours will take you to One Foot Island, Honeymoon Island, Aikami Island, the only one with a basic lodge, and the island where Survivor Cook Island was shot. You can also rent your own boat and go wherever you please but the organized tours are quite fun and gather a funky crew. I booked the Vaka tours, owned by Air Rarotonga, and mostly made of day trippers from Rarotonga into Aitutaki. The company sells tickets including flights and the tour and you are out and back into Raro on the same day. We started with Aikami. A beautiful strip of beach which already weted my appetite for what to expect. Since we had taken off I was already on Cloud nine. The blue, the dense coconut trees on every island, the lack of civilization or even the slightest sign of human impact made it one of the most beautiful places I had ever seen. On Aikami we got to walk around the island, to soak in its warm waters. It looked as if someone had poured flour on the water and stirred. The water was very clear but it looked as if it was mixed with flour to make a magic potion. There was only another small motor boat on shore and then just us. A very basic set of huts on the sand attested to the fact that you could spend the night there. It would be a true Robinson Crusoe experience and what a pleasure to have it all to yourself. Our next stop took us to Survivor Cook Islands show set. We got out on an orange-looking beach and crossed through the thick foliage to the back of the island where it turned volcanic and black sharp rocks met the sea. The remnants of a serious coconut husking exercise were still lying limp on the ground. The island’s water was a tad greener than the rest because of some algae and rocks and it did not seem to offer much in way of survival. It was surprisingly small, especially when compared to the TV series. I realized how misleading TV can be. It wasn’t the nicest of all the beaches we visited but it was still stunning and its volcanic character gave it a rough fighter look. It was still a very pretty place. After frolicking in the shallow crescent beach we jumped back on to the boat and made a stop in open sea to snorkel. The water was still very shallow and we could stand up but whenever we were ready to dive in we could go deeper to a sandy bottom filled with corals, giant clams and charlie, the mascot giant trevally, who tends to come say hi to tourists every time. Needless to say he is a friendly but absolutely scary fish of horror movie dimensions. After snorkeling we sailed to the last stop for the day: famous One Foot Island. Known for the legend which surrounds it and because you can get your passport stamped, One Foot Island merits a visit regardless of these two gimmicks. It is a stunning island connected to a sandbank you can walk to even at hide tide. Nature has created some of the most picturesque and picture worthy frames with palm trees horizontally jetting off the shore onto the water, falling coconuts and views over deserted islands. What a stunning island. Although most tours will end there I decided to go out on another tour a day later onboard my private motorboat. I was joined by an American couple I had met on the first tour and we set out to explore Honeymoon island. This is an island where a couple decided to get married and honeymoon a couple of decades ago. The island is slightly bigger than the rest but made of a large sandbank dotted with small coconut palm trees which have been planted by the numerous couples who come here to bless their union. There is even a bamboo arch to capture that perfect shot. The water and the sand are you own perfect slice of paradise. What a stunning place, absolutely marvelous. 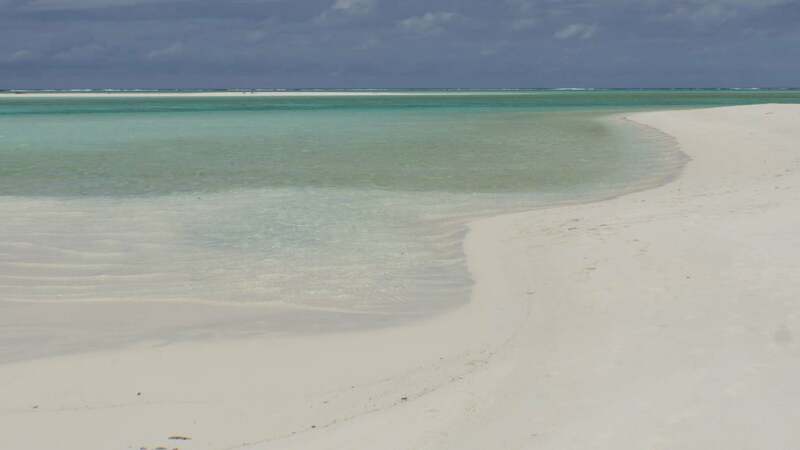 Aitutaki Lagoon is one of those places that carves a special corner in your heart. It is beautiful in the way that only a preciously untouched place made of the purest beauty can be. You are get mesmerized, as if you had been charmed by a genie, and nothing else matters. The sun shines, the palm trees pose for you, the water caresses your feet and you can’t help but feel that you have arrived at the most breath-taking place in the world where Gods and Goddesses must have frolicked in the dreams of the believers.